Download this whole collection for just $9.00. 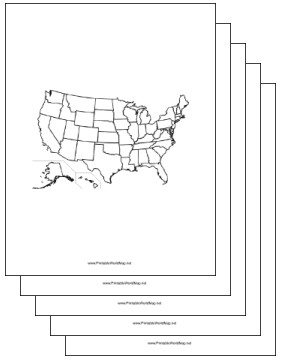 The United States blank Map Collection - landscape includes a map of the USA, plus individual maps of each of the 50 states and the District of Columbia. (52 maps in all.) The maps are laid out in portrait orientation (pages are taller than they are wide), and none of the maps are labeled. Can you correctly identify all 50 states?